East Midlands Christmas Tree Farms: choose-and-cut Christmas trees, Tree lots with pre-cut trees, stands, sleigh rides, hay rides and related winter events and fun! Whether you want to cut your own tree, pick a live tree and have it cut for you, buy a tree already cut or buy a living tree you can plant, this page provides detailed listings of East Midlands's choose-and-cut Christmas tree farms, places to buy pre-cut (also called pre-harvested and fresh-cut) trees, stands, sleigh rides, hay rides and related winter events and fun. Some listings are for tree farms, others are tree lots, and some only offer hay rides, sleigh rides or other winter events. READ EACH LISTING to know what each facility offers. The farms are listed further down this page, so scroll down the page! Since this service is free and open to ALL Christmas tree farms, not just those who belong to an association or pay for an ad, like almost all other websites do, this is the most complete and current listing available! I'm always looking for more to add, and to correct any inaccuracies or errors, so if you encounter any, please email me! And please tell the farmer you visit in East Midlands that you found their farm here! I need the farmers to realize that you found them here so that they will keep their information up to date! Do you know of any Christmas tree farms or other special Christmas and winter events in East Midlands? Please tell me about them - Click here to write to me! Top Of Intake Lane,cromford ,derbyshire, Derby, De43rh. Phone: 01629 824968. Open: Every day dark till dark. Directions: Off the a6 at cromford to the very top of intake lane. Payment: Cash, Cheque. Due to extensive maintenance and re-planting, for heath and safety it is no longer possible to access to dig out or cut your own tree from the plantation this year (2018). However, there will still be a large selection of cut trees to chose from. U-Choose and Cut varieties: Douglas Fir, Nordmann Fir, Norway Spruce. Kings Mills, Park Lane, Castle Donington, Derby, DE74 2RS. Phone: 01332 853004. Open: Monday to Saturday, 9am to 5pm; Sunday 10am to 4pm. Directions: From the crossroads traffic lights in Castle Donington village centre turn onto Park Lane and travel for approximately one and a half miles. The Nursery is situated just past Home Farm on the right hand side. Click here for a map and directions. Payment: Cash, Debit cards, Visa/MasterCard. Click here for our Facebook page. Christmas tree stands, Christmas lights. At Donington Nurseries we provide fresh British grown trees, available in a range of different varieties and sizes so that you are guaranteed to find the right tree for you. All of our trees are unpacked and netting removed on arrival ensuring that you are able to see exactly what you are buying. Our trees can be re-netted at no extra cost so that you can transport them home a little easier! PreCut varieties: Fraser Fir, Lodgepole Pine, Nordman Fir, Norway Spruce. Living, rooted tree varieties: Deodara Cedar, Nordman Fir, Norway Spruce. 5th - 16th December 2015: Hall opens at 10.30am until 4pm (last entry at 3.30pm). Restaurant will open at 9.30. Drawing inspiration from the traditional carol so well loved across the country, this December Haddon Hall in Derbyshire's Peak District presents: The Twelve Days of Christmas. Featuring everything from 'swans a swimming' in the waters of the River Wye which flow past the hall, to pipers piping and dancing ladies in the courtyards of Haddon, the traditional sights and sounds of Christmas throughout history will be displayed to delight all ages as you wander through the hall and grounds and spot each symbol from The Twelve Days tale. The ancient rooms at Haddon will be dressed with swags, firs and natural decorations in keeping with the hall's beautiful medieval architecture, with a little touch of contemporary glamour to really shine. The great fires will be roaring - conjuring up a truly atmospheric setting to get visitors in to the festive spirit and experience Christmas past and present. Also, Our very popular evening Candlelight tours will be running again this year. Visitors are invited to walk the Hall with our knowledgeable guides when it is at its most atmospheric. Haddon comes alive with Christmas spirit by candlelight, so join us for a special treat and take in the beauty of the rooms dressed for the festive season, during twilight hours. We offer a Two Course Menu andf a Tour only or Tour and Meal. Matlock Road Kelstedge, Chesterfield, S45 0DX. Phone: 01246 591516. Email: info@marshgreenfarmshop.co.uk. Open: Monday to Saturday from 9am to 5pm Sunday from 10am to 4:30pm. Click here for current open hours, days and dates. Directions: Located on the A632 between Chesterfield and Matlock. Click here for a map and directions. Christmas Trees are available from the 28th November until Christmas Eve. Payment: Cash, Debit cards, Visa/MasterCard. Click here for our Facebook page. We will be selling Christmas trees again this year! They are arriving to the farm shop on Tuesday 21 November and will be available to buy from Wednesday. Troway Hall , Troway, Coal Aston, Sheffield S21 5RU. Phone Number: 01246 413809. ALternate phone: 07770 592500. Odd as it seems, they say their website is "MediBee". So, I'd recommend calling before you go, to confirm hours and availability.There is an article about the tree farm here. Warren Hill, Newtown Linford, Leicestershire, LE6 0AL, Phone: 01509 266489. ALternate phone: text 07974 735474. Email: enquiries@bradgatetrees.com. Open: from 9:30 until 6 pm, from Friday 23rd of November until Christmas Eve Directions: opposite Bradgate Parks Old Johns car park on Warren Hill between Newtown Linford and Woodhouse click here for a map. Our trees are harvested daily and will keep their needles because they are really FRESH. Go in to the plantation and select your special tree dig it up yourself (Santa's elf's will help you) or choose from the large selection of harvested trees with or without roots. You can choose from the hundreds of tradtional Norway Spruce, Nordmann Fir, Blue Spruce and Danish Blue trees growing in the plantation which you can either then dig yourself to maintain the root quality or we will cut your tree for you. We also sell potted trees. We will net and load your tree, whilst you enjoy a glass of sloe gin. We can also arrange free local delivery. Why not combine your visit with a walk in Bradgate Park for a fun family day in the countryside. Payment: cash, only. Once you've chosen your perfect tree we net your tree and load your car, all part of the service, whilst you enjoy a complimentary home made sloe gin, mince pie and sweeties for the children. Digby Drive, North Luffenham, Rutland, LE15 8JS, England. Phone: 01780 720 607. Email: sales@digbyfarm.co.uk. Directions: Digby Farm is located in the village of North Luffenham, Rutland. Found between Oakham and Stamford on the south shore of Rutland water, the village is easily accessible from the A1, A43, A47 and the A606. Just look for the giant inflatable Santa! We sell everything to do with Christmas trees and decorations. For more information, see these pages: retail sales, wholesale sales, tree information, wildlife and directions and maps. n our display stands you can choose from a large variety of trees - varying in size, style and price whilst in our Christmas shop you can find stands, wreaths, decorations, lights for indoors and out, gifts and more. Our experienced staff are always on hand to advise you and happy to help in any way we can. PreCut varieties: Norway Spruce, Nordmann Fir, Balsam Fir and more. Gelsmoor Road Coleorton , Coalville, Le678jf. Phone: 07753 180677. Email: Gelsmoorlandscapes@gmail.com. Open: 7 days a week 8am till 5:30. Directions: Norway spruce, blue spruce and nordmann fir trees available. Payment: Cash, Cheque. Google has photos here. Oakberry Farm, Lutterworth Road Dunton Bassett, Lutterworth, Leicester, LE17 5JU. Phone: 01455 208879. Email: enquiries@oakberrytrees.co.uk. 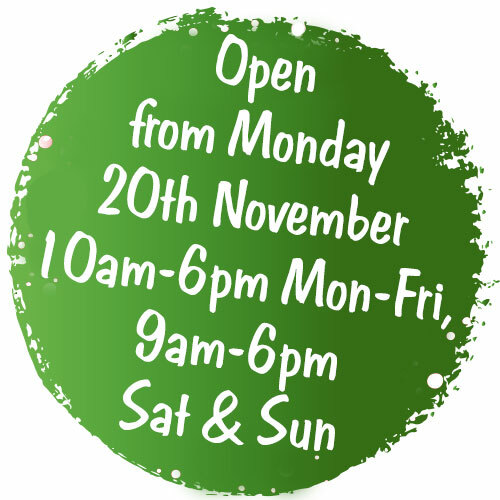 Open: Monday to Saturday 9.00am to 7.00pm, Sunday 9.00am to 5.00pm From 25th November until Christmas Eve (at 1.00pm). We also sell Fresh Christmas Wreaths, Stands, Lights and other items for the festive season.. Directions: We are situated on the main Leicester to Lutterworth Road (A426) just South of Dunton Bassett. The entrance is well marked with signs in both diections. Click here for a map and directions. Payment: Cash, Cheque, Debit cards, Visa/MasterCard, AmEx. Oakberry Farm has been a working farm for many years, mainly growing arable crops. In recent years areas of land have been reserved for planting Christmas Trees. Each year from the beginning of December until Christmas Eve 'Oakberry Trees' comes to life, selling Christmas Trees to the public. For more informations, see these pages: About Us, Tree Varieties, Tree Stands, Directions, Tree Care, History. You Choose and We cut varieties: Blue Spruce, Fraser Fir, Nordman Fir, Norway Spruce. Hinckley Road, Sapcote, Leicester, NA LE94LG. Phone: 01455 274049. Email: info@sapcotegc.co.uk. Open: from 9am-5pm on Monday to Saturday and from 10am to 4pm on Sunday. Directions: See their website for directions. Payment: Cash, Debit cards, Visa/MasterCard . Nordman Fir and Norway Spruce Christmas trees for sale from Sapcote Garden Centre in Leicestershire. Potted Christmas trees also available. Always going the extra mile to help customers find their perfect tree. We always stock premium quality non-needle drop Nordman Christmas trees, and are well known for it around Leicestershire. Delivered within hours of being chopped down. Helpful staff so you can choose the perfect tree. Great value - Trees starting from £28! Nordman Christmas Trees are expected on the 28th of November, so mark it down in your diary. From Blaby to Oakham, our customers come from far and wide to buy some of the best Christmas trees in the county! With sizes from 4ft to 9ft+ we are guaranteed to have the perfect tree for your home this year. Christmas Tree Delivery to Leicester: We can deliver your Christmas tree right to your front door for added convenience! And as all of our trees have a unique label, the tree that you pick out is the exact same one that will be delivered. We are offering free local delivery of Christmas trees on Saturday 9th December. A visitor writes on November 13, 2013: "Biased because I work there, but we always aim to help customers find their perfect tree, even unwrapping 50+ trees for one person!" Ravenstone Road, Ibstock, LE67 2NW. Phone: 01889 586593. Email: info_nationalforest@forestry.gsi.gov.uk. Open: Call or write before you go to confirm - there is no information on their website about Christmas for this year. Last reported was Saturday and Sunday from 10am to 4pm, 30th November to 21st December. Directions: Click here for a map and directions. Farmers Market with locally sourced products on 8th December from 10am to 4pm Visit Santa in his grotto on a one day in December (call!) only £3 per child. Payment: Cash, Cheque. This is a small Forestry Commission site run by local volunteers at this popular local park. For every tree sold the volunteer group receive £3 for projects on the park to help improve it for visitors and wildlife. The Forestry Commission have teamed up with the Midlands Air Ambulance to provide a free tree carry out service at weekends to help you carry your tree to your car. The Midlands Air Ambulance is a charity that provides emergency response cover across Cannock Chase and Staffordshire, and would be thankful for any donations. At other times Forestry Commission staff will be happy to help you carry your tree should you require assistance. East Ravendale, Grimsby, Lincs. Phone: 01472 822 442. Castle Farm, Fillingham, DN21 5BX. Phone: 01427 667014. Email: sales@fillingham-trees.co.uk. Open: from 28th Nov: 9am to 5pm Monday to Sunday, Dec Opening: 9am to 6pm Monday to Friday; 9am to 5pm Saturday and Sunday. Directions: Off the B1398, 8 miles north of Lincoln. Click here for a map and directions. Pick Your Own Tree and Rosie the Reindeer Christmas Trail on November 24 and 25 and December 1 and 2 from 9am to 5pm each day; Refreshments, tractor and trailer rides plus craft activities for children. Payment: Cash, Debit cards, Visa/MasterCard. You Choose and We cut varieties: (they may not be offering cvut your own this year) Nordman Fir. Hewitt\'s Ave, new waltham, grimsby, NA DN36 4RS. Phone: 07968 955240. Email: info@peakstopfarm.com. Open: 10am to 5pm daily, We are open for sales from December 1st up to Christmas. Directions: See their website for directions. Click here for a map and directions. Payment: Cash, only.. Each year we sell our freshly cut Christmas trees direct from our North East Lincolnshire farm. We have been planting trees on the farm for the past 8 years. We now have a large number of the 'traditional' Norway Spruce variety and Nordmann Fir variety which hold their needle longer growing in our fields. We offer a "pick your own tree" service where the tree of your choice will be cut for you straight from the field. Alternatively you can select a cut tree from the pre cut selection on display. Rooted trees are also available, please ask for prices and availability. Trees can be delivered directly to your door for a charge of £5 within a 5 mile radius of Peaks Top Farm. We will have a wide variety of freshly cut Christmas trees ranging from 4ft in height up to 8ft for those of you with high ceilings! We are conveniently situated outside New Waltham village, close to both Grimsby, Cleethorpes and the surrounding area of North East Lincolnshire. Town Gate Farm 130 Station Road, Stallingborugh, DN41 8AW. Phone: 01472 885911. Email: roger@towngatefarm.co.uk. Open: daily from 9 am untill 4:30 pm (daylight hours); 1 to 20 December. Click here for current open hours, days and dates. Directions: Our farm is just a short distance off the A180 in the village of Stallingborough, near Immingham. The village is mainly one long road, just look out for the Christmas Tree signs on the farm gate near the Green Man pub. Click here for a map and directions. Corporate customers, schools and churches May need a tree before 1 December, please do get in touch and we can arrange a tree for you. Payment: Cash, Cheque. All our trees are home grown, we don't buy trees in from other sources, so nothing you buy from us has been cut for any length of time. Plantation Lodge Farm Castle Bytham, Grantham, Lincolnshire, NG33 4SP. Phone: 01780 410101. Fax: 01780 411092. Email: snowbird@btconnect.com. Open: every day from 9 am until 5 pm from Saturday 26th November until Wednesday 21st December; If you would like to come out of hours, just give us a call. Directions: Find us on the South side of the South Witham road, one mile West of Castle Bytham and two miles East of the A1. We are only ten miles from Stamford fifteen miles from Grantham ten miles from Bourne and fourteen miles from Melton Mowbray. . We are open December. Our hours are: We open each year on the 1st December for 'choose and cut'or cut tree sales.Members of BCTGA and FARMA. We aim to offer the best range of different species available locally. Choose from an extensive range displayed inside our tree barn, or bring your wellies and choose your own tree from our plantation. Our trees are grown with minimum chemical input. Come and meet our small flock Shropshire sheep who do most of the weeding! With four and a half acres of 'Choose & Cut' plantation and trees from eighteen inches to eighteen feet tall, our Christmas tree farm is small and family friendly, but still big enough for you to find your perfect tree. Come and see the widest variety of trees available in the area, all freshly cut and either growing in the plantation or displayed in our beautiful tree barn together with a great range of tree stands and carefully selected decorations. Maltby Wood, Little Cawthorpe, Louth, Lincs. Phone: 01507 605 193. Email: peterstrawsonlimited@btconnect.com.Also Stands and Netting. Northgate Pinchbeck, Spalding, PE11 3TB. Phone: 01775 640935. Email: trees@alpinesandgrasses.co.uk. Open: Every day throughout the Christmas period, from 10 am to 4pm. Click here for current open hours, days and dates. Directions: We are situated on Northgate, West Pinchbeck. Travelling from Spalding, turn off B1356 in to Knight Street, past Pinchbeck PO, The Ship Pub and continue for 2 miles along Northgate. The Nursery is the first on the left after the crossroads linking Gosberton Risegate and Money Bridge Lane. Click here for a map and directions. Payment: Cash, Cheque. Click here for our Facebook page. We have now been selling fresh Christmas trees from our family run nursery for the past 13 years. Regular visitors have become accustomed to buying a locally grown, long lasting tree. This means the tree's wonderful scent is at its peak and it maintains its needles for longer. Both the Nordman and Spruce are available as cut or pot-grown trees. Alpines and ornamental grasses also available as single pots or planted arrangements - ideal Christmas gifts. Nettleton Gap Moortown Road Caistor Lincolnshire, Cherry Willingham, Market Rasen, ln76hy. Phone: 01472 851309. Email: exp252@tiscali.co.uk. Open: 7 days, 9 am to 4 pm, Call for extended hours. Directions: Just off the A46 at Caistor, follow Moortown road towards Moortown. Click here for a map and directions. Payment: Cash, only. Christmas Trees now in. Nordmans and Spruce. Can deliver. Bulby, near Bourne, Lincs. Phone: 01778 591 357. Glebe Road, Mears Ashby, Northampton, NN6 0DL. Phone: 07833 915 338. Alternate phone: 07711 818529. Email: andrew.pitts@afinter.net. Open: on weekends from 10am until 4pm from Saturday 1st December until Sunday 16th December when we will be closing at 1pm. Directions: Christmas Farm is half way between Beckworth Emporium and Britton's Nursery just north of Mears Ashby. All three of us have the same post code, NN6 0DL, so if it doesn't say Christmas Farm on the sign at the entrance you are at the wrong place! ring us on 07711 818529 and we will guide you in. Click here for a map and directions. Payment: Cash, only. Welcome to Christmas Farm! Explore our beautiful forest of specially selected Christmas trees lovingly planted and pruned by hand for your perfect start to Christmas. Walk through the trees, select the perfect one for you and we will cut it, wrap it and put it in your car for you. We will even take a photo of you in front of it for you to share with your friends!. Come and visit our farm north of Mears Ashby, Northampton where every tree we sell has been hand-grown, pruned and nurtured by us for you to enjoy all Christmas long. All our trees are 'Choose and Cut' so your tree is only harvested by us once you have made your selection guaranteeing you the freshest tree possible as well as giving you a unique Christmas experience. So grab your wellies and come and enjoy complimentary mulled wine as you explore our beautiful conifer forest to choose your special tree from the hundreds ready now for your Christmas this year. Our beautiful mistletoe will be arriving just in time for opening! It's freshly cut from growers in Worcerstershire and hand-tied in bunches ready to hang. Georgina or Siouxzie will be happy to help you to choose the perfect ribbon from our wide selection and prepare a bunch especially for you. Shuckburgh Road, Staverton, Daventry, Daventry, NN11 6JY. Phone: 01327300471. Email: skylarkfarm@icloud.com. Open: from 27th November until December 24th seven days a week from 9am until 6;30pm. Directions: situated on the a425 between Daventry and Southam just outside the village of Staverton. Click here for a map and directions. Open for Christmas trees from November 27th until December 24th, from 9 am until 6:30pm, turky orders accepted until December 18th and pumpkins available from September 20th;farm shop open all year round, 7 days a week from 9 am until 6:30 pm. Thank you! The Thomas family. Payment: Cash, Debit cards, Visa/MasterCard, AmEx. SANTA IS COMING: First 3 Weekends in December plus 21st and 22nd, times, 10am -3pm; Call 01327300471 and select the 'shop' option to book your slot. £6 per child which includes seeing the reindeer and santa with present. Santa and his reindeer are available this year and also our home grown christmas trees. U-Choose and Cut varieties: Blue Spruce, Noble Fir, Norway Spruce. You Choose and We cut varieties: Blue Spruce, Noble Fir, Norway Spruce. PreCut varieties: Blue Spruce, Noble Fir, Norway Spruce. Living, rooted tree varieties: Noble Fir, Norway Spruce. U-Choose and Cut varieties: Blue Spruce, Fraser Fir, Noble Fir, Nordmann Fir, Norway Spruce. You Choose and We cut varieties: Blue Spruce, Fraser Fir, Lodgepole Pine, Noble Fir, Nordman Fir, Norway Spruce. PreCut varieties: Blue Spruce, Fraser Fir, Lodgepole Pine, Noble Fir, Norway Spruce, Sierra Redwood. LLiving, rooted tree varieties: Blue Spruce, Fraser Fir, Nordman Fir, Norway Spruce. Bawtry Forest Christmas Trees - Precut Christmas trees, potted Christmas trees, stands, scented candles, table centres, and Christmas wreaths. Botany Bay Farm, Babworth, Retford, Notts. Phone: 01302 710 465. Open: from 20 November and 10am to 6 pm Monday to Friday; 9 am to 6 pm on Saturday and Sunday !We have a variety of tree species on sale: Norway Spruce, Lodgepole Pine, Nordman Fir, Noble Fir, Douglas Fir & Sitka Spruce to name just a few. We also have a number of larger trees which can be delivered in the Retford and Bawtry areas and collected after Twelfth Night. For more information, see these pages: Our tree species. and Festive holiday products, Contact us. Bawtry Forest Christmas Trees,.Visit us at Botany Bay in Retford, or at our NEW LOCATION within Bawtry Forest, where we've added lots more parking, flood-lights and Christmas lights for later opening until 6pm, walk-through decorations and gift shop, a lovely cafe, mulled wine and festive music. We have a huge variety of tree species and sizes available: Norway Spruce, Lodgepole Pine, and Nordman Fir to name just a few. We also have a selection of potted Christmas trees, stands, scented candles, table centres, and Christmas wreaths. Sherwood Pines Forest Park, Kings Clipstone, Mansfield NG21 9J. Phone: 01623 825411. Email: sherwood.fdo@forestry.gsi.gov.uk. Open: 10am to 5pm, from Saturday 24 November to Sunday 16 December; Plus we'll be open until 8pm on Thursday 6 and Friday 7 December. 2018 prices start at £30. Costs vary depending on the size and species of tree you choose! Directions: Sherwood Pines Forest Park Christmas Tree Sales is in the main visitor centre area. To get to the forest follow the brown tourist road signs for Sherwood Pines Forest Park. It is located off the B6030 between Old Clipstone and Ollerton. We offer a wide range of sustainably grown Christmas trees. All trees are netted by our team for your convenience. Please note that we get one delivery of trees. When they are gone, they are gone. If you are wanting a large tree get in early as they usually sell out quickly. Make magical Christmas memories in the forest. While you are here visiting our Christmas tree shop, have a bite to eat from our festive food stall and take a family photo at our seasonal selfie scene or make a full day of your visit and enjoy our Christmas trail in the forest. Also on selected dates we will have live music entertainment - visit our Facebook event for more information. The Poplars, Wollaton Road , Nottingham , NG9 2PD. Phone: 0115 7840376 . Fax: 07905847491. Email: sayhello@thechristmastreecompany.com. Open: Our typical season is from the last weekend in November until the 23d of December , Monday to Friday, from 3:30pm until 7 pm; we suggest you call in the week , hours will vary ! Saturday and Sunday, from 9am to 6pm; Please call before visiting after 5pm. Directions: We're in the centre of Beeston just off Wollaton Road (opposite Lidl) at "the poplars" you can't miss us. If your arriving from the A52 to need to turn at the nurseryman pub up Wollaton road into Beeston. You cant miss us once you get to lidl. We have to parking spaces to the front of our shop please drive in. Otherwise you can use lidl for 90 minutes free of charge. Click here for a map and directions. Payment: Cash, Debit cards, Visa/MasterCard. Click here for our Facebook page.